It's no secret; Cinema Touching Disability is a huge fan of My Gimpy Life! We were delighted to get the chance to ask creator and star, Teal Sherer (below, left), about the show, working as an actor with a disability, and more. Check it out! Please give a brief description of My Gimpy Life for the people who have not seen it yet. My Gimpy Life is an award-winning online comedy series about the awkward adventures of a driven actress trying to navigate Hollywood in a wheelchair. What inspired the creation of MGL? Being in Felicia Day’s hit web series The Guild definitely influenced me to want to create a show of my own. I realized that instead of waiting for acting opportunities to come my way, I could create my own. And as a disability advocate, I wanted to share my perspective and broaden people’s minds. Disabled people are out in the real world, but we’re underrepresented in films and on TV. Why did you choose to use the word “gimpy” in your title? Titles can be tricky. We wanted something that would catch people’s attention and represent the tone of our show. “Gimpy” seemed like a perfect fit. How many of the scenes in MGL are based on your experiences? On the creative side, Gabe Uhr (MGL writer and producer) and I work on stories and then he writes the show, and then we produce it together. A lot of the first season of My Gimpy Life is based on my real life experiences, like the alley audition or the time a stranger asked me an extremely personal question in a bank parking lot. We start with those moments, and then create characters and stories to heighten them. In real life, I generally avoid confrontation and brush those things off, but that wouldn’t make a very interesting show. There’s plenty of my real life in Season Two, even if it’s something mundane like getting dressed to go out, but in this season Gabe and I started exploring the relationships between fictional characters. I don’t have a roommate or a circus boyfriend so a lot more is made up this time around, but there are still real, relatable moments. Tell us about the process that you went through in order to start your own web series. Though I had the idea for My Gimpy Life, I’m not a writer so Felicia Day recommended that I meet with a comedy writer named Gabe Uhr [Right: Gabe and Teal in a scene together from Season Two]. We immediately hit it off, and our first step was to create and shoot a pilot (which is now Episode 3 “Inspirational”). After receiving great feedback on the pilot at festival screenings, we reached out to production companies in the hopes that they'd want to produce a full season of our show. We didn't have any luck with that, but we did end up catching the attention of Steven Dengler, an entrepreneur who co-founded the currency site XE.COM. Steven supports a lot of cool projects, tech companies, and charities through his investment company Dracogen. He believed in me and My Gimpy Life and literally made my dream a reality by sponsoring our first season. After using a Kickstarter campaign to raise funds for Season 2, are there any interesting tidbits or lessons learned from that experience? It was our Executive Producer Steven Dengler who suggested we look at crowdfunding to raise funds for Season 2. The process of running a campaign like that was exhausting, but it made our community of fans even stronger. When our goal looked to be in doubt, it was so gratifying to see strangers campaigning so passionately to help us reach it. And through that we found another great partner in Russell Winkelaar, who is our other Season 2 Executive Producer. How long does it take to shoot a whole season? Are you aware of any film companies who were inspired, by your series, to improve accessibility of their place of business to accommodate other actors/actresses with disabilities? Unfortunately, I’m not aware of any, but hopefully some have been. Has this show led you to any additional acting opportunities in Hollywood? It has led to roles in other web series, as well as some voice-over and theatre jobs. Have you had any job offers outside of acting, such as directing, as a result of MGL? No, I'm not a director and really don’t have any experience directing (except for in my college theatre classes). Who knows, maybe down the line. Would you like to expand the reach or audience of MLG with either a movie or series on television/ cable/ Netflix? Though MGL has been a critical success, we'd still like more people to find the show, so Gabe and I are focused on that. We'll actually be releasing a new trailer of our full series soon. Our marketing so far has really been word of mouth, so we really appreciate everyone who watches the show and spreads the word. How do you feel about actors who are able-bodied being cast to play characters who have disabilities, such as Arnie in Glee or the lead character in Ironside? I don’t fault any able-bodied actor for playing the role of a character with a disability. But oftentimes, actors with disabilities aren’t even given a chance to audition for these roles. If we aren’t given the opportunity than we are loosing the opportunity to move forward in our career. I want producers and casting people to consider disabled actors for any role, not just ones that are written as disabled characters, like teacher, best friend, scientist, or whatever. The stories don’t necessarily have to revolve around disability for those characters to exist. According to your experiences, are there more opportunities for actors with disabilities now than there were in the past? 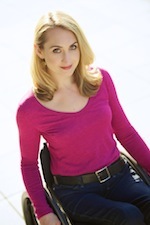 From my experiences, no - I do not think there are more opportunities for actors with disabilities. But there are more opportunities for actors with disabilities to create their own content which is what we have to do. What is your favorite disability film? The documentary Murderball about quadriplegic athletes who play wheelchair rugby and their journey to the 2004 Paralmpics in Athens, Greece. It was funny, raw, and a great representation of disability. When and where can we tune in to see more episodes of My Gimpy Life? You can watch all of our 9 episodes on our YouTube Channel, www.youtube.com/mygimpylife.